This is the page for Airzone and Variflex ENCLOSURE parts ONLY! 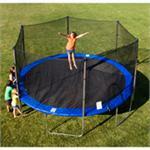 If you are looking for TRAMPOLINE PARTS for the AirZone, Bravo Sports, or Variflex trampolines click here. Also check out the Variflex enclosure parts and the Airzone enclosure part categories as your trampoline and enclosure model may be in another category besides Bravo Sports. Bravo Sports enclosure models comes in a variety of sizes and models. When searching for your enclosure model, if different model numbers are available, be sure you are choosing the right enclosure. 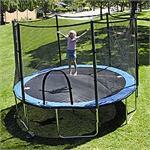 Check out a tag on the enclosure netting, trampoline leg or trampoline mat as well as your trampoline and combo manual.